Come relax at La Torreta! 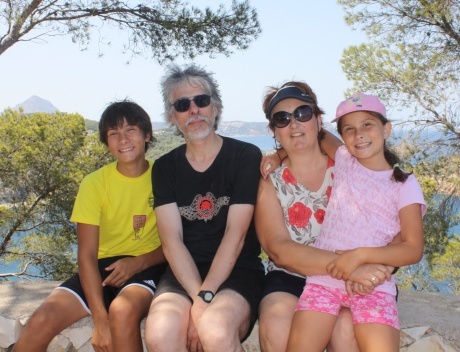 Here are the four of us : Ines, Victor, Antoine and Pura. Ines and Victor go to school; Antoine is an engineer, and I take care of my visitors, hoping they’ll have good memories of their stay with us. We love this area, its nature, its specialities; the idea of creating the guest house came naturally. We had experienced for twenty years the hectic life of Paris, France, and left it all, to come back to a countryside lifestyle, that is quiet, rich in fresh air and nature. We decided to settle down in this region of Valencia, Spain, because of its exceptional weather, its protected natural areas, and the warm hospitality of its inhabitants. In addition, my roots are here, all my family live here. Antoine got charmed since his first trip here. Our Valencian friends (old high school friends of mine) say we know the region better than many locals. Imagine: sun all around the year, within Europe! The mountain, the countryside and the sea… what more can you dream of? We love the cultural and artistic life, very present in the region. Valencia is the home town of many well-known painters, musicians, architects and writers. Well, to make a long story short, we fell in love with the area, and are longing to share our enthusiasm with you.